Experience the most epic DJ competition at the DMC World DJ Championship Finals and witness the crowning of the world’s greatest DJ on September 24th at London’s 02 Forum in Kentish Town from 2pm – 11pm. 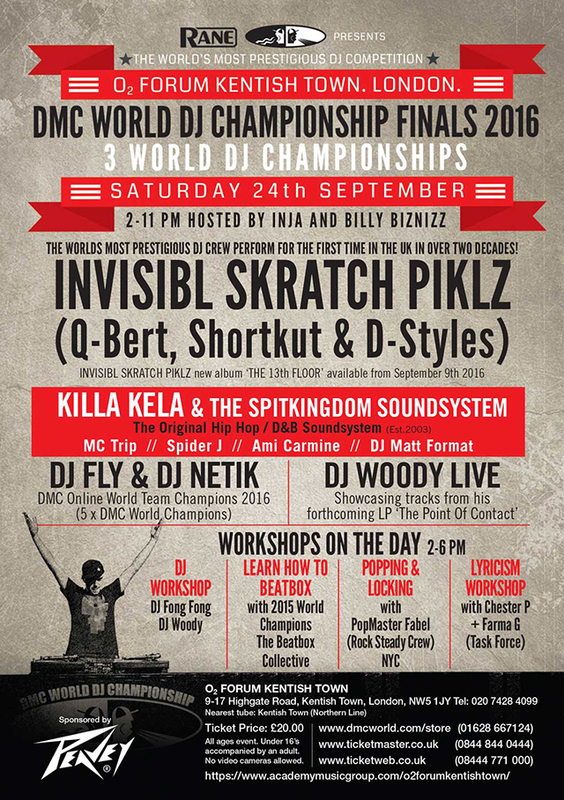 On Saturday, September 24th the iconic DMC World DJ Championship Finals returns to London at the historic 02 Forum in Kentish Town where the most established DJs across the globe take their skills to the stage in one of the most fierce and prestigious DJ Battles in the world. From DMC battles, legends are made! Running annually since 1985, the championship is sponsored by American pro audio equipment manufacturer Rane and has firmly rooted itself in DJ history as one of the most internationally recognized events in DJ culture. In addition to live performances, this year’s event offers and a running set of four workshops to all attendees from lyricism/DJ lessons to breakdancing and beatboxing introduction tips taught by industry professionals. Each workshop is set to focus on a particular aspect of hip-hop culture and supports a more interactive environment, allowing guests to hone their own skills to further appreciate the ever-evolving art form while experiencing the professionals at work. Visit the Turntablism course page for detailed information on this program here.